You can draw or write inside the Notes app. You can use either use your finger or a stylus. There are a number of practical uses but as a grandfather I use it to launch a classic game of tic tac toe to play with my grandson. 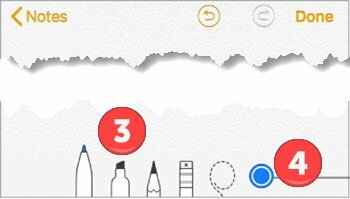 Or you might use this feature to capture a handwritten note and quick back-of-the-napkin drawing. 2 Tap the pen. Or if the pen is not displayed, tap +, then tap the pen. 5 Draw or write on the screen.